Objective: The purpose of the Helmet of salvation and the Sword of the Spirit. What does the Armor of God protect us from? Who gives us this Armor? Salvation means to be saved from something. Biblically this salvation means to be saved from death (Unit on Salvation in Week 34). Once we are saved, we can always defeat the devil. The sword is a weapon to fight back and defend yourself. The Sword is the Bible (Unit on the Bible starting in Week 30). The Holy Spirit helps us recall Bible verses that we have memorized. 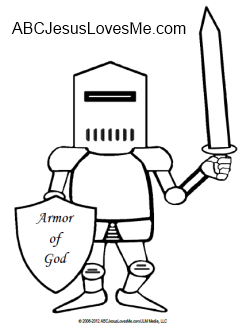 - Stamp the Armor of God worksheet with a rectangle-shaped sponge (like a sword) and paint. 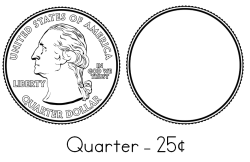 The quarter is worth 25 cents (1/25th of a dollar). The quarter has the profile of George Washington, the 1st President of the United States of America. The back of the quarter varies. In 1999, the US Mint began producing a series of 50 state quarters, featuring each state's history, traditions, and symbols. Then in 2010, the US Mint began producing a series featuring designs depicting national parks and other national sites. Examine the coin with a magnifying glass. - Coin Rub: Tack down one quarter heads up and several different quarters tails up. Place a piece of paper over the coins. Using a silver crayon, color over the coins to make an impression. - Color the head of the Quarter worksheet silver. Have the child create her own backside or redraw her state's quarter. - Find a Coin: Hide a few pennies, nickels, dimes, and quarters in a tub of shredded paper or oatmeal. Have the child name the coin and say the correct rhyme for the coin found. - Play Store: Pretend to purchase things around the house using coins. 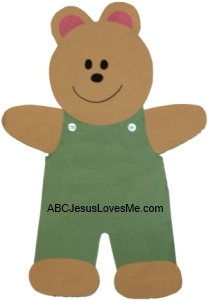 - Use Corduroy to discuss how to handle a situation when you are lost. Helper are builder, architect, computer engineer, teacher, baker, sales clerk, artist, etc. Ask the child what he would like to be when he grows up. Talk about that job and how those in this profession help others. Have the child draw a picture of himself in this role. - Visit the library to find books on this profession and take a field trip to visit a job site. Use the Zz Writing worksheet and for further learning check out the Letter Z Activities. On a piece of paper draw pictures to represent the beginning, middle, and end of Corduroy. - Show your child how to sew on a button. - Talk about the emotions that Corduroy feels throughout the book. Discuss times that your child has felt that same way. - Play "Find the Button" - Hide a large button and have your child look for it. Draw an oval, triangle, square and star using thick lines. 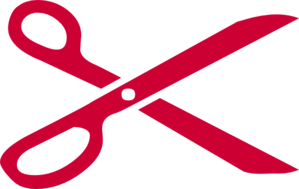 Have your child cut around shapes that you have drawn. Create a Memory Obstacle Course with letters and numbers. If the child is ready, ask her to get both a number and a letter. Teach pencil control with the Shape Mazes. Instruction the child to keep the pencil from hitting the lines while doing the mazes. 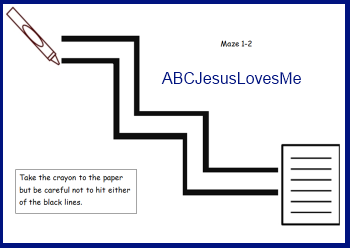 Additional mazes available in the ABCJLM Visual Perception Workbook.